Several months ago I bought a “Jolly Bar” of Moda Fabrics (Zen Chic – “Fragile”) – that’s fabric cut into 5″ x 10″ rectangles containing one (sometimes two) strips of the collection’s fabrics. I realized the half-squares were too large for a lap quilt, and the rectangular shape required a wasteful method of creating flying geese. Nevertheless, I decided to go ahead but I needed more fabric. I added some turquoise (which is hinted at in the printed fabric collection but not used as a background colour in any). There were also nowhere near enough light coloured rectangles to construct the flying geese so I went through my fabrics to find white, pale grey, & pale turquoise cuts. Because I wanted to end up with a lap quilt size, I scaled down the darker rectangles – 4.5″ x 8.5″ (for the “geese” portion), trimmed the remaining light ones to 9″ then cut them in half for 4.5″ squares to construct the flying geese – 48 rectangles / 96 squares. The quilt top in the Zen Chic version of “Twisted Geese” also uses solid blocks – once I’d finished assembling the flying geese (forty-eight in all) I added eighteen 8.5″ x 8.5″ squares from some fabrics in my stash (a few of which were yardage from the Zen Chic “Fragile” collection I bought a couple of months ago) to complete the arrangement. So here is my tentative layout – definitely a non-traditional distribution for a flying geese array. 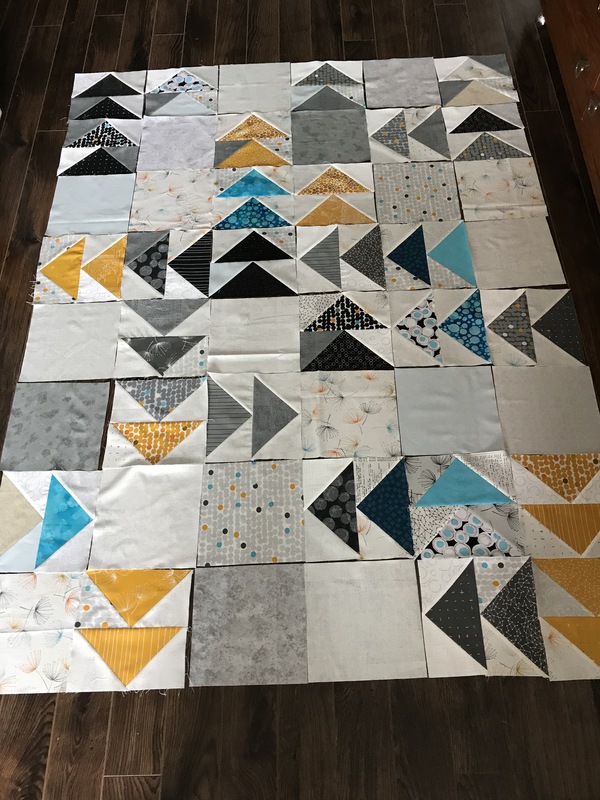 I plan to use the 4″ equilateral triangle off-cuts to create half-square triangles for the back – I have 96 already cut and laying in pairs – it’s just a matter of sewing them together along the bottom edge (being careful not to stretch the fabric). Tomorrow I will sew the forty-eight blocks together. I am planning on a 1″ narrow border to extend the quilt top just enough so the binding won’t disrupt the side points of the geese. I’m back at regenerating socks from the pile in my “Fix” sock basket. 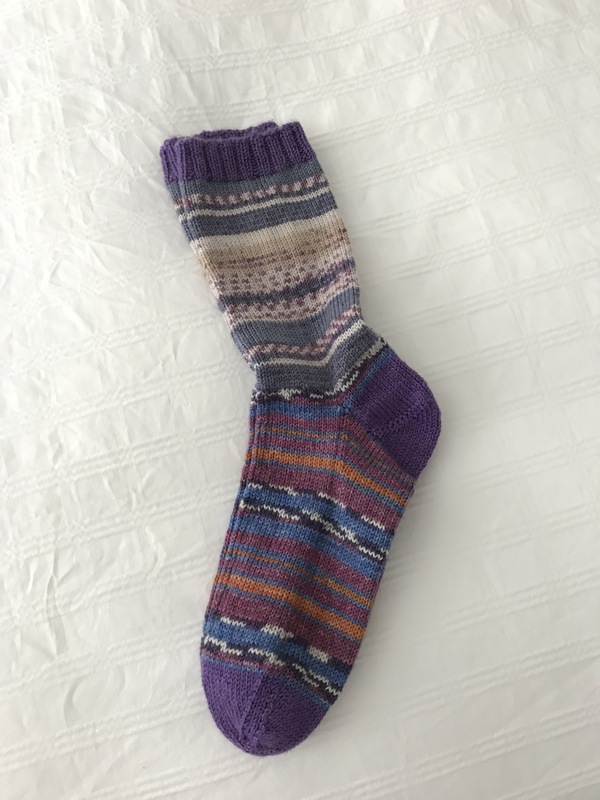 I started with somewhere like eight pairs of socks to restore – some needed just heels, others needed full feet. I repaired (replaced heels on) three pairs a number of months ago but there were still five pairs in the basket. I started working on those where I was able to salvage legs only a couple of weeks ago. It’s still worth repairing these socks – the legs are fine and that saves me about a week’s work. The challenge is to come up with variegated yarn that kind of fits in with the original pattern. So far, I’ve done rather well. Here’s the first pair I completed ten days ago. They were delivered back to the owner who thought they looked familiar but didn’t remember giving them to me for repairs. This is the second pair I finished last evening. It took six days to reknit the feet and the yarn I used works quite well. I’ve started on the third pair of legs – that will leave me two pairs that need just heels – they won’t take a lot of time. I’m probably not going to work on those immediately, however. 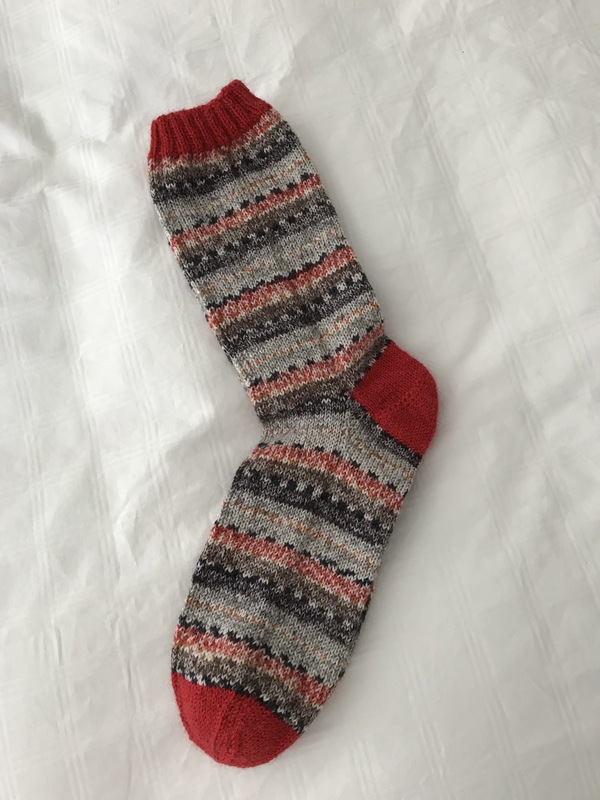 I want to continue building up the stash of new socks – Christmas is coming and I’ll want to give some socks as gifts. When in Parrsboro last August (2017) I stopped off to visit my friend Ruth. She’d been working on this crazy quilt (heavily embroidered, with beads and buttons). She had a large surface completed, but there were still corners and spaces at the sides that needed additional fabric as well as embroidery. She’d lost interest and the quilt was in a bag at the back of a closet in an unused room. I persuaded her to get it out. I offered to take it home, complete the top, and back the quilt for her. But I had a lot of other quilting, sewing, knitting I wanted to get done and didn’t get around to it for months. During the winter I took it out of my closet. I assessed what needed to be done, trimmed the top to a reasonable queen size and put the quilt back in the bag – not hidden in a closet now, but in plain sight along with another project I had agreed to do for a friend. I walked past it every day but didn’t get to it until I’d finished all the work I wanted to get done for Parrsboro this year, and finished hemming the multiple skirts on a prom dress which had been hanging around for the past six months (the prom was a year ago, the dress was now just a wardrobe addition so no urgency about completing it). Five days ago I pulled out the crazy quilt and said to myself “This is it”. My goal was to get it completed in time to take it to Parrsboro when I go on July 28 to hang the show. 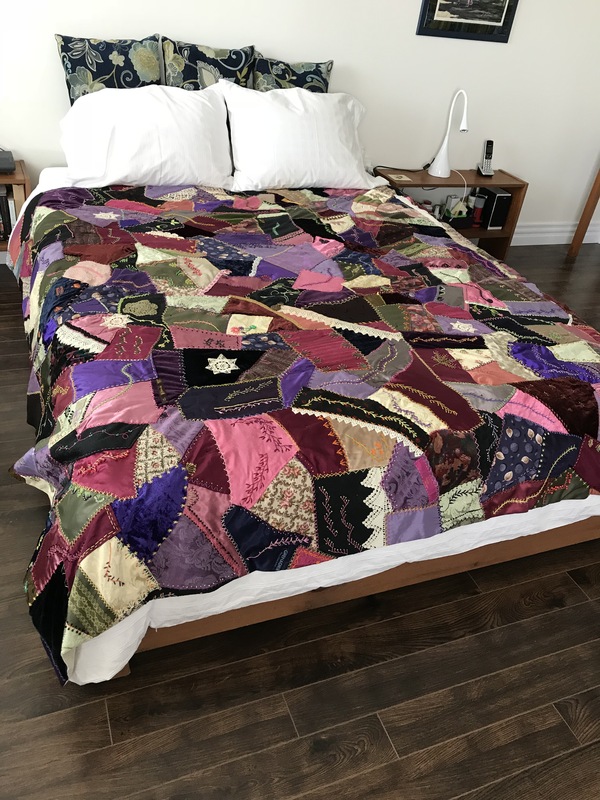 Ruth’s Crazy Quilt – Finished! I added fabric to the bare spots, quilted the edges on my embroidery machine, set up backing fabric (which I’d bought last week), took the whole thing to the Friday knitting group to help me pin back to front. I laid out the backing fabric on the large table surface in our common room (I’d pressed the backing to remove folds and creases then trimmed it to the approximate size of the top), placed the crazy quilt top face down on the backing. Collectively we pulled the backing taut, smoothed out the quilt top, and pinned the edges. Yesterday, I stitched around the outside (leaving an opening to turn the quilt right-side out), then pinned top to back and began to tie the two together using a variegated sock yarn. A big tedious job. I’ve just finished all the tying – the knots are on the back (the ties are barely noticeable on the quilt top which was my intention). I’ve even added a label. It’s done! I’ve put Ruth’s quilt with my quilts and wall art headed to Parrsboro. I’m not going to call ahead to let Ruth know her crazy quilt is coming home. If she’s not at home when I get there, I know the front door will be open and I will lay it on her sofa. She’ll know where it came from. It will be a nice surprise for her and I’m glad finally to get it out of my house. That’s it for projects I’ve taken on for other people. Now back to quilting for myself. 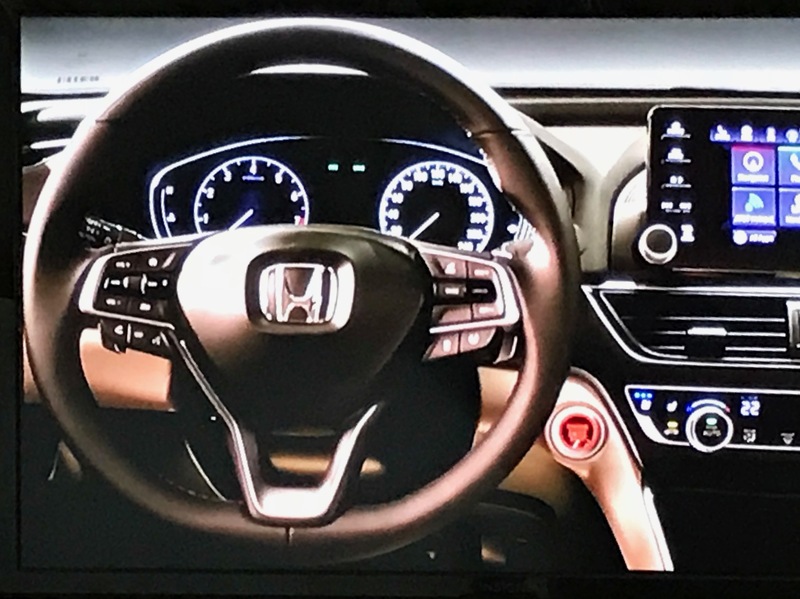 I was watching TV last evening while knitting socks – I caught this image of the interior of a Honda Accord as it flashed by. The “face” of a “bear” (or some other animal) was so strong I actually paused the program, rewound it until I was able to see the image clearly. I captured it with my phone. Think about it – how many people were involved in the interior design of this vehicle – a lot, I’d say. I can’t believe nobody picked up on this “face”. It’s so strong – I’d never be able to sit behind this steering wheel without feeling uncomfortable. What about you? Do you see it? The phenomenon is called pareidolia. I have a strong propensity to see faces in inanimate objects – I’ve mentioned it before. But I have to say, this is one of the strongest “faces” I’ve come across and I find it uncomfortable. 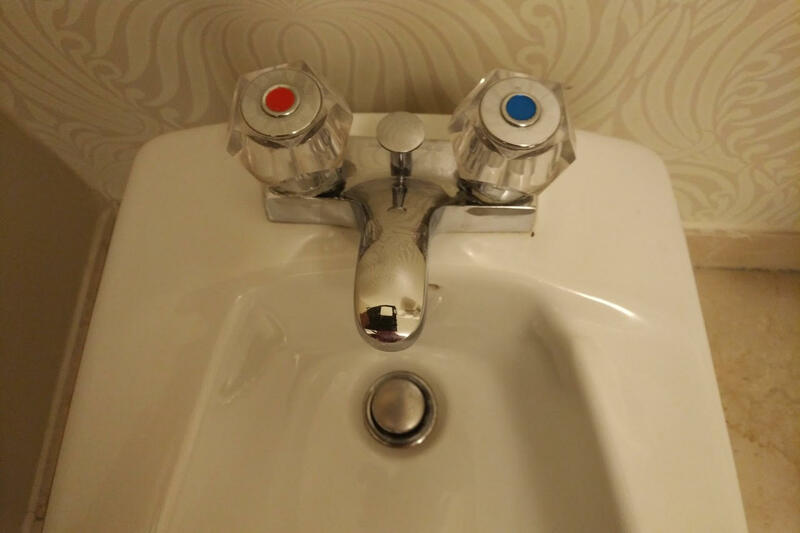 Here’s what she had to say about it: “A little unnerving having this guy staring up next to me in the hotel bathroom in Montreal today! I bet she was aware of that face every time she used that bathroom. Finished this pair a couple of days ago. They’re for my chiropractor who did me a wonderful favour. I thought a pair of bright socks was a reasonable thank you. 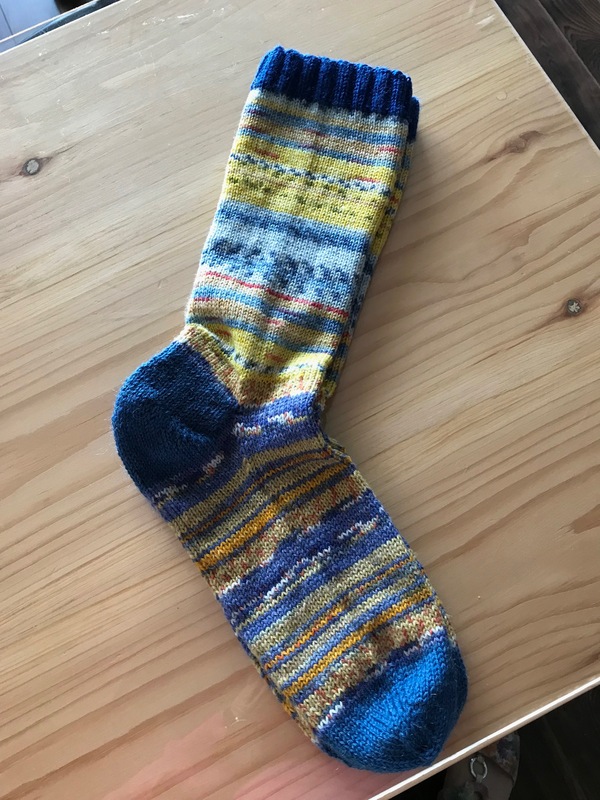 I did think about keeping them for myself as I was knitting them, but after making the foot long enough for a man’s size 9-10 shoe they are definitely a gift. I think he’s confident enough to proudly wear bright red/grey/black socks. He’ll appreciate them in the middle of winter. Right now it’s 30+ C and very humid. Wool socks are very far from anybody’s mind right now – except for me who happens to be knitting them in the evening. Just finished the panel. (It’s actually squarer than the photo shows – its all about the angle I’m holding the phone at). Finished size: 20 3/4″ x 16 1/2″. Techniques Used: Raw Edge Appliqué, Thread Painting, Machine Embroidery. In the end I did less thread painting than I originally intended – I did none on the court walls other than to secure the edges. The grunge fabric provided quite a bit of texture which I decided I didn’t want to disrupt so I left the dark backing alone after embroidering the Jacob’s Creek name and logo. I did the barest amount needed to hint at the shadows of Federer created by the overhead lighting. 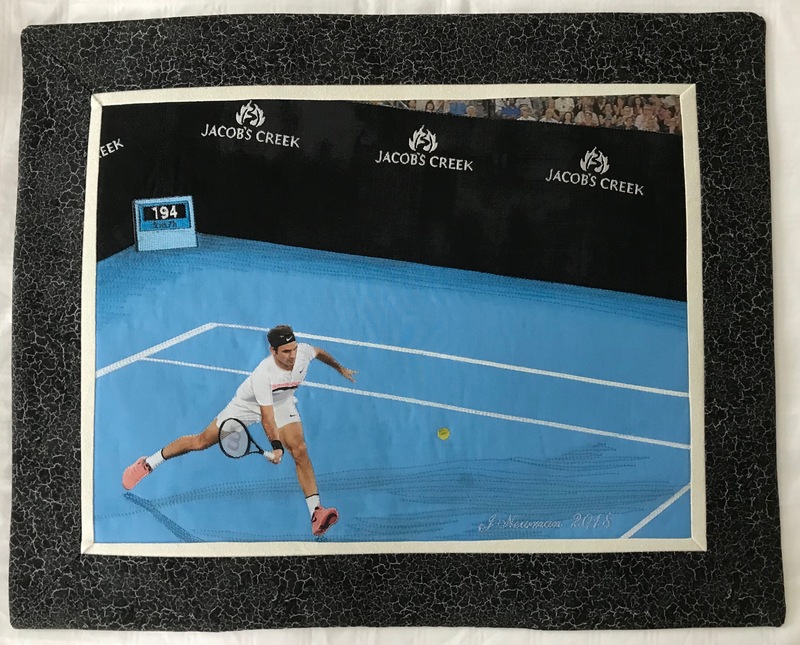 I did densely stitch the white lines on the court to hold those narrow pieces securely. But that was it. That’s all the wall art for now. This is #9 of the pieces I wanted to complete for the showing at the Art Labs in Parrsboro end of July to mid-August. Added to the 8 quilts I have ready, the gallery walls will be full. I have two large projects I agreed to do for other people that have sitting around for more than 6 months – I have to get them done and out of the apartment. Then I can turn to making some clothing for myself and think about how to use a couple of fabric collections I bought for quilts a couple of months ago. So lots more sewing/quilting waiting for me.